Is Lack of Sleep Killing Our Teens? We all know how important sleep is – if you don’t, go without it (or without enough of it) for a few days and then see what happens, even in the short term. Now consider the established consequences of chronic sleep problems: increased risk of hypertension, diabetes, obesity, depression, heart attack, and stroke, among other health issues. Who’s suffering? Anyone can experience sleep problems, whether short or long term, but research is revealing one population may be at particular risk: teens – and some of the consequences are issues that already keep worried parents awake at night. A study by the Centers for Disease Control and Prevention suggests teens who get less than seven hours of sleep a night are more likely to engage in one or more risky health behaviors including texting and driving, drinking and driving (or riding with a driver who’d been drinking), or not wearing a seat belt than teens who get nine or more hours of sleep nightly. Of course, all of the above behaviors increase the risk of serious injury or death. 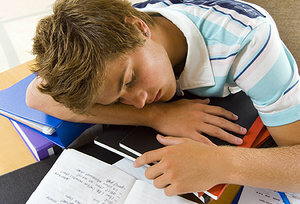 Be Consistent: Teens need approximately nine hours of sleep a night to function optimally. To achieve this, try to maintain a consistent sleep-wake schedule throughout the week and even on weekends. Nap Wisely: A good nap is a great way to rejuvenate, but limit them to 20-30 minutes in the early afternoon only to avoid difficulty falling asleep at night. Exercise Matters: Consistent exercise of at least 30-60 minutes a day, four-plus times a week, will help teens sleep better – but make sure to avoid exercise within 2-3 hours of bedtime. Eat Smart: Going to bed hungry (or too full) can cause sleep problems, so eat healthy meals throughout the day and a light snack 1-2 hours before bedtime. Preparation Is Key: A quiet, comfortable, dark bedroom is ideal for proper sleep. Another key: Keep it clean (a challenge for many teens) and relaxing. To read the clinic’s complete list of sleep recommendations for teens, click here. If you’re a teen or the parent of a teen who’s having trouble getting adequate, restful sleep, talk to your doctor about these and other solutions.